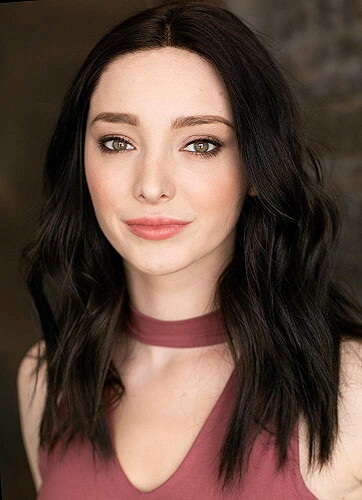 Named one of fall TV's breakout stars by IndieWire, Emma Dumont has quickly become known for the powerful characters she brings to life on screen. Dumont can currently be seen starring on FOX's drama series "The Gifted," which follows an ordinary suburban family whose lives change course forever when they discover their children have developed mutant powers. "The Gifted," based on Marvel Comics' X-Men series, is set in an alternate timeline where the X-Men have disappeared. Dumont shines as Polaris, daughter to X-Men character Magneto, however while brave and loyal, she struggles with an internal darkness and teeters in and out of control due to an undiagnosed bipolar disorder. "The Gifted" premiered on October 2, 2017 and is currently in production of season 2. In addition to "The Gifted" Dumont recently starred as Charles Manson's dedicated follower Emma Karn on NBC's 60's-era drama "Aquarius" opposite David Duchovny. She also appeared on ABC Family's scripted dance series "Bunheads" as Melanie. Dumont made her feature film debut in director Craig Johnson's "True Adolescents" at 12 years old, alongside Melissa Leo and Mark Duplass. Additional credits include: "Mind Games" for ABC, "T@gged" for AwesomenessTV, "Pretty Little Liars" and "The Fosters" for Freeform, and "The Magicians" for SYFY. Born in Seattle, Washington Dumont had a love for the arts at a young age. She began ballet dancing at just three years old and studied at Pacific Northwest Ballet School, Cornish College of the Arts and Spectrum Dance Theatre School, while spending summers at the American Ballet Theatre, Joffrey Ballet School and the Bolshoi Ballet Academy in Moscow, Russia. At four years old she began taking violin lessons and went on to play with the Seattle Youth Symphony Orchestra and the Glendale Youth Orchestra. At 15 years old Dumont won V Magazine's model search contest and appeared in their March 2010 issue, landing a contract with Ford Models. She worked fashion week in New York City that year, and went on to model in Hong Kong, New York, Los Angeles, China, and Tokyo. While Dumont was excelling in dance, music, and modeling, one of her biggest passions was acting, and she continued to hone her craft in community theater and classes, landing roles in indie films in her teens and a handful of series roles. While acting and the arts are two of Dumont's greatest loves, she also has a passion for mechanical engineering and computer programming. She is a member of Mensa and participated in FIRST Robotics on a team sponsored by NASA/JPL and Walt Disney Imagineering. Today, Dumont remains passionate about mentoring youth associated with the program. While her current production schedule is demanding, Dumont is continuing her studies and is taking classes in engineering and programming. She currently resides in Los Angeles with her puppy Zoe. 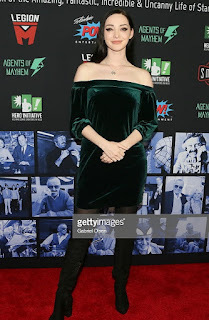 Hollywood, Calif.​ – January 30, 2019 – ​“Excelsior! A Celebration of the Amazing, Fantastic, Incredible & Uncanny Life of Stan Lee,”will be attended by Mark Hamill, RZA, Clark Gregg, Felicia Day, Bill Duke, cast members from Marvel’s “The Runaways,” cast members from FX’s “Legion,” and Fox’s “The Gifted,” among many other luminaries from the entertainment world. Fans wishing to attend “Excelsior! A Stan Lee Celebration” can get a limited number of tickets at legionm.com/stantribute​.​ ​All net proceeds from the event’s ticket sales will go to the​ ​non-profit organization ​The Hero Initiative​, a charity supporting comic book creators, artists and writers in need. The tribute event on ​Wednesday, January 30,​ will begin at 4 p.m. PT with a section of the TCL Chinese Theatre forecourt transformed into a fan experience of Stan Lee’s life and career. There will be a memorial centered around his cement imprint which will be displayed next to the speaker’s podium. Ticketed fans will be allowed to leave flowers, candles and sign a book of condolences. Photos, artwork, Stan’s classic comic books and memorabilia will be on exhibit in the forecourt along with a special preview of pop-culture artist Rob Prior’s upcoming gallery show ​The Legacy Collection of Stan Lee. ​ Prior will do a live painting in the forecourt during the opening portion of the tribute. Artist Jennifer Contini will also have her series "This Love Lives On" featuring images of Stan Lee on display. The White Castle Crave Mobile will be serving sliders, one of Stan’s favorite snacks, for all the fans. Producers of the event, Legion M’s David Baxter, Stan Lee’s POW! Entertainment’s Bob Sabouni and Agents of Mayhem Darren Passarello will greet fans and introduce several public speakers before Kevin Smith arrives and assembles an honor guard of world class cosplayers representing many of Stan’s co-creations, including Avengers, Spider-Man, Dr. Strange, and more to pay their respects and lead the crowd in a final salute to this legendary pop culture icon accompanied by a police band of pipes and drums. On the red carpet, a group of veterans from Veterans in Media & Entertainment and The American Legion of Hollywood Post 43 will honor Stan for his service during World War II, and Chief Paul Cell, President of the International Association of Chiefs of Police, will recognize Stan’s contributions for his work supporting law enforcement and creating safer communities. Family from the other co-creators of the Marvel Universe will attend to pay their respects and join in the celebration, including Tracy and Jeremy Kirby, grandchildren of Jack Kirby, Mark and Stephen Ditko, nephews of Steve Ditko, and Jenna Parker, daughter of Sol Brodsky, all of whom were part of the original Marvel Bullpen. After red-carpet arrivals, the tribute will commence in the TCL Chinese IMAX Theatre where Kevin Smith will moderate conversations with celebrity speakers from the entertainment industry including Mark Hamill, Rob Liefeld (Co-Creator of Deadpool), Michael Uslan (Executive Producer, “The Dark Knight”), RZA, and Tom DeSanto (Executive Producer, “X-Men”). The evening will also include discussions with stars from the comics world and Stan’s personal friends, including Marv Wolfman (Blade creator), Marvel’s Chief Creative Officer Joe Quesada and Executive VP, Head of Television Jeph Loeb, artist Bill Sienkiewicz (Elektra: Assassin), and Stan’s business partner at Stan Lee’s POW! Entertainment, Gill Champion. Members of the creative team behind the Academy Award®-nominated “Spider-Man: Into the Spider-Verse,” including writer/producer Phil Lord and producers Chris Miller, Avi Arad and Amy Pascal will also be on stage to honor Stan. Producers Lauren Shuler Donner and Derek Hoffman round off the evening’s panels as they speak to and celebrate the modern impact of Stan’s characters through two decades of X-Men in film and television. The evening will be complete with video tributes from stars who are unable to attend as well as live celebrity performances of Stan’s favorite music and poetry. Both companies are working with Stan Lee’s POW! Entertainment, the multimedia company founded in 2001 by Stan with his friend and business partner Gill Champion, its president. Stan Lee’s POW! Entertainment is the sole owner of the Stan Lee name and all new original content he created since 2001. Under the leadership of CEO Scott D. Williams and Gill Champion, the company has been and will continue to be the guardian of Stan Lee’s legacy and is excited to roll out new projects and new adventures Stan had been working on. On behalf of Stan Lee’s POW! Entertainment, Chief Marketing Officer Bob Sabouni will be overseeing and guiding the tribute day alongside the other event partners. Producers of the tribute event will continue to announce additional details for the event via social media feeds. Details of specific speakers, performers and other activities will be shared on the social channels for Kevin Smith, Legion M, Agents of Mayhem, and Stan Lee’s POW! Entertainment. (@TheRealStanLee, @ThatKevinSmith, @LegionMOfficial, @AgentsofMayhem). Emma also stars as Polaris from the show, The Gifted. Emma Dumont on the Red Carpet at Stan Lee's Tribute with JBN Journalist, Allan Forte. Legion M is the world's first fan-owned entertainment company that is revolutionizing the way entertainment is made in Hollywood by uniting a growing fan community of 50,000+ members, including more than 10,000 fan-owners. Through its Fan-Owned business model, Legion M invests in a diverse slate of original projects in various stages of development, including the feature film and comic book ​Girl With No Name multiple original television series including “Evermor,” “Airship Cowboys,” and “Malice;” as well as interactive and VR-based projects, including "ICONS: Face to Face" starring Stan Lee and Kevin Smith. 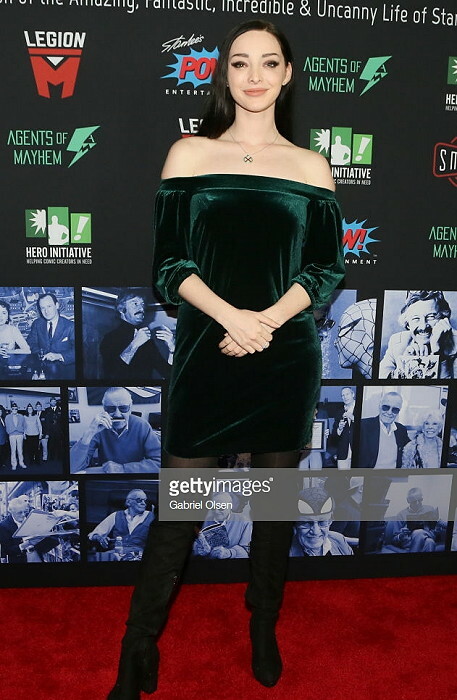 Legion M also invests in partner productions, including the critically acclaimed ​Colossal, starring Anne Hathaway and Jason Sudeikis, and directed by Nacho Vigalondo, the cult hit ​Mandy​ starring Nicolas Cage and directed by Panos Cosmatos, and ​Bad Samaritan starring David Tennant and directed and produced by Dean Devlin. 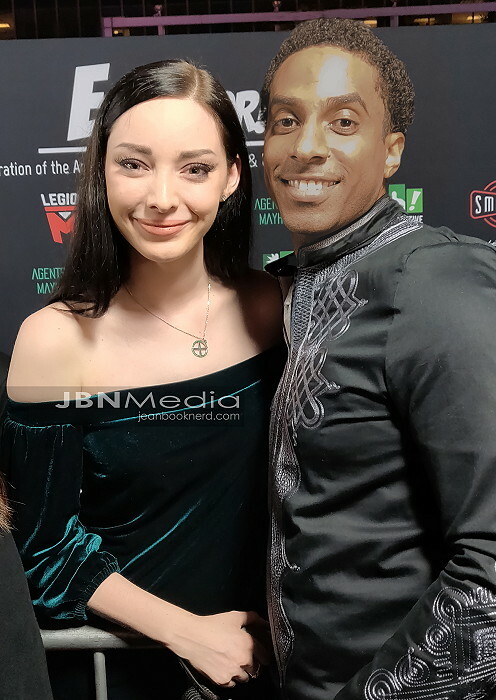 Legion M and its fan community has produced high-profile events honoring some of the industry's biggest names, including the Stan Lee hand and footprint ceremony at Hollywood's TCL Chinese Theatre in 2017. To learn more about Legion M and become a member of the Legion for free, visit ​www.legionm.com​. The Hero Initiative is the first-ever federally chartered not-for-profit corporation dedicated strictly to helping comic book creators in need. Hero creates a financial safety net for yesterday’s creators who may emergency medical aid, financial support for essentials of life, and an avenue back into paying work. It’s a chance for all of us to give back something to the people who have given us so much enjoyment. Since its inception, The Hero Initiative has had the good fortune to grant over $1 million to the comic book veterans who have paved the way for those in the industry today. For more information, visit ​www.heroinitiative.org​ or call ​626-676-6354​.